The conference programme, with listings of all accepted panels and individual papers assigned to time-slots is now available for viewing here. A complete list of registered delegates is available here, and will be updated as necessary. The list of current exhibitors at the conference is available here. In a first for BAJS, this conference will feature a programme of five documentary films being shown on days two and three of the conference (6-7 September). The directors of all five films will be in attendance and available for Q&A sessions about their work. See here for details of the films, and the conference schedule for show times. The conference plenary speakers, Professor Gennifer Weisenfeld and Professor Mōri Yoshitaka, have agreed to offer a masterclass for postgraduate students on the morning of 5th September 2018, prior to the official start of the conference. For full details, and to register to attend the workshop, see here. The conference will include an opportunity for students at any level of study to present a poster to showcase their research, with cash prizes available for the best Research Postgraduate, Taught Postgraduate and Undergraduate offerings. A limited number of bursaries are available to support one day attendance by students at the conference to take part in this session. For more details, see here. Students presenting at the conference and based at UK institutions of higher education can obtain financial support for conference attendance from BAJS. Information on this is available here. The conference will also be able to offer a limited number of bursaries of £250 to students presenting at the conference who are based at non-UK higher education institutions. Students who wish to apply for one of these should send a brief case for support (maximum 250 words), accompanied by a letter of support from their doctoral supervisor, to [email protected] by 8 June 2018. These will be assessed by the conference committee and successful applicants will be notfied after that date. Payment of the bursaries will only be made after proof of expenditure, including original receipts have been received. The payment of these bursaries has been made possible by the generous support of the conference by the Great Britain Sasakawa Foundation, supplemented by a small quantity of funding provided by BAJS Council. Since the collapse of the Bubble Economy, Japan has often been described as being in demographic, economic or and/or social crisis. 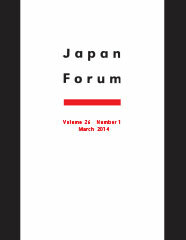 In recent years, however, significant legal and constitutional changes have been proposed, implemented and resisted; signs of sustained economic growth have appeared for the first time in several decades; and a reassertive global image of what it means to be Japanese is being promoted, particularly in the leadup to the Tokyo Olympics of 2020. As in other moments in Japanese history, tensions between desires for transformative social change and continuity have reappeared, framed by regular moments of crisis, sometimes real, sometimes perceived. Debates over how political, social, economic, and cultural change occurs in Japan, both in the past and present, have often swung between these narratives of crisis, continuity and change. These frameworks have also shaped much of the study of Japan in the UK and elsewhere across a wide range of disciplinary approaches. In the sesquicentennial of the Meiji Restoration and the fiftieth anniversary of the debates prompted by the protests of 1968, the British Association for Japanese Studies, with the School of East Asian Studies at the University of Sheffield, invites scholars to reflect on these narratives of change, continuity and crisis and their usefulness in the 21st century. Confirmed keynote speakers for the conference are: Professor Mōri Yoshitaka (Tokyo University of Arts) and Professor Gennifer Weisenfeld (Duke University). We are delighted to have two leading scholars in Japanese Studies joining us who are both in different ways interested in exploring cultural and social responses to crisis. Further details on the speakers is below. Mōri Yoshitaka is Professor in Sociology and Cultural Studies in the Graduate School of Global Arts at Tokyo University of the Arts. He holds a PhD and MA from Goldsmiths, University of London and a BA in economics from Kyoto University. Professor Mōri is the author of multiple books and articles on contemporary social and cultural movements, art and culture in times of crisis, and cultural industries in East Asia. Publications include Sutoriito no shisō (The Philosophy of the Street) (2009, in Japanese and Korean) and Popyura ongaku to shihonshugi (Popular Music and Capitalism) (2007, 2nd ed. 2012). In English, he has published in journals including Inter-Asia Cultural Studies, World Art and the International Journal of Japanese Sociology. Gennifer Weisenfeld, Professor in the Department of Art, Art History, and Visual Studies and Dean of the Humanities at Duke University, received her Ph.D. from Princeton University. Her field of research is modern and contemporary Japanese art history, design, and visual culture. Her first book Mavo: Japanese Artists and the Avant-Garde, 1905-1931 (University of California Press, 2002) addresses the relationship between high art and mass culture in the aesthetic politics of the avant-garde in 1920s Japan. And her most recent book Imaging Disaster: Tokyo and the Visual Culture of Japan’s Great Earthquake of 1923 (University of California Press, 2012, Japanese edition Seidosha, 2014) examines how visual culture has mediated the historical understanding of Japan’s worst national disaster of the twentieth century. She is currently working on two new book projects, one titled The Fine Art of Persuasion: Corporate Advertising Design, Nation, and Empire in Modern Japan, and the other, Protect the Skies! Visualizing Civil Air Defense in Wartime Japan. Following a review of the submissions, accepted paper and panel proposers have now been notified, and we expect to open conference registration at early-bird rates shortly. If they are not already, become BAJS members. The Association can be joined via the BAJS website at: https://www.bajs.org.uk/register/ Current members can confirm their membership status at: https://www.bajs.org.uk/login/ UK nationals who complete a Self-Assessment Tax Return can claim the cost of their BAJS subscription against income tax. (See: https://www.gov.uk/government/publications/professional-bodies-approved-for-tax-relief-list-3/approved-professional-organisations-and-learned-societies#j). The conference registration fee covers: the delegate pack; attendance at all conference sessions, including film shows and the welcome reception; refreshments throughout the conference; and lunch on 6th and 7th September. Payment of the conference fee must be made via credit/debit card to the University of Sheffield’s online store. A link to the payment page will be available from the conference webpage next week, once the fees are published. For any queries regarding payment of conference registration fees, contact the School of East Asian Studies’ Finance Officer, Mrs Lisa Knowles ([email protected]). Complete the relevant form to provide names; email addresses; affiliations; paper titles; and finalised abstracts for inclusion in the conference programme. Please be sure to check these details carefully to avoid errors. We look forward to seeing you in Sheffield in September. Further discussion of the conference can take place on the BAJS Conference 2018 Facebook discussion page (https://www.facebook.com/events/757387251104168/?active_tab=discussion) . The conference is pleased to offer a variety of opportunities for sponsorship and exhibitions. A full list of prices and benefits can be found here. Information regarding a PhD/early career workshop to precede the conference will be published shortly. The University of Sheffield is a leading international research university and member of the Russell Group. Located in South Yorkshire and within easy access of several major international airports, Sheffield is a vibrant post-industrial city surrounded by the natural beauty of the Peak District National Park. The University of Sheffield’s School of East Asian Studies (SEAS) is one of Europe’s leading centres for research and teaching on East Asia. Originally established in 1963 as a priority national centre for Japanese Studies, SEAS now hosts large and growing undergraduate and postgraduate programmes in Japanese, Korean, Chinese and wider East Asian Studies and hosts a significant number of globally-recognised scholars working in the fields of East Asian politics and international relations, modern and contemporary history, economics and business, film and media studies, anthropology and sociology, linguistics, literature and language. The 2018 BAJS conference local organising committee consists of Harald Conrad, Peter Matanle, Thomas McAuley (Chair), Mark Pendleton, Kate Taylor-Jones and Anna Vainio. The conference is generously supported by the Great Britain Sasakawa Foundation, The Japan Foundation, Japan Forum, the SOAS Japan Research Centre, and the School of East Asian Studies.